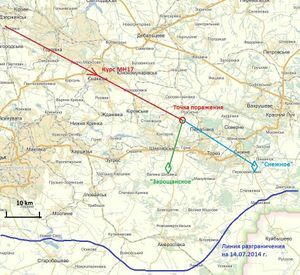 A number of Russian sources claim that MH17 was shot down by a BUK missile fired by Ukrainian forces from Zaroshchenskoye south of Shakhtarsk. 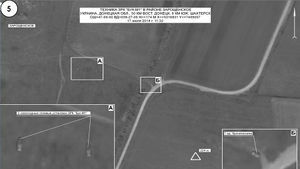 Satellite photos of alleged Ukrainian BUK missile launchers in Zaroshchenskoye, presented by the Russian Ministry of Defense in their briefing on July 21, 2014. Technical analysis of the shrapnel damage by Almaz-Antey that backtracks the flight path and launch site to within 1.5 km of Zaroshchenskoye. Alleged anonymous Ukrainian sources, that claim MH17 was shot down by mistake during a training exercise in Zaroshchenskoye. 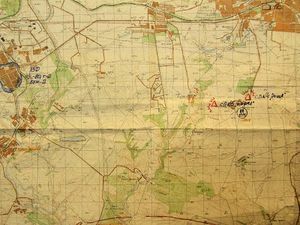 Tactical map of the 95th Brigade from July captured by DPR forces showing a BUK battery at the alleged launch site. A cipher telegram from ATO headquarters on July 15th, ordering the 3rd battalion of the 156th anti-aircraft missile brigade (3-й ЗРДН 156 ЗРП) to transfer to the area of Zaroshchenske. 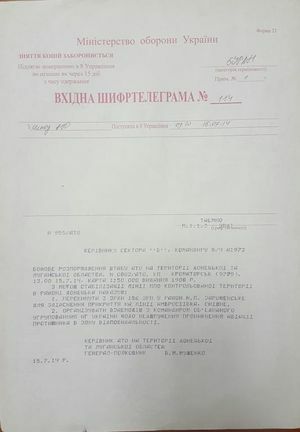 (Note that according to Wikipedia Muzhenko received the rank of General-Colonel only on August 23, 2014, but signed as General-Colonel on this telegram. Poroshenko decree 679/2014 awarding the rank appears to be no longer available from the official site). Most of this evidence is unverified and can as well be forgeries. Time may be a mistake, there is summer time in Moscow, that is UTC +4 in summer; so then time when image is said to be taken, 7:32 UTC. As it is one hour earlier, a place on Earth will be further West due to Earth rotation, compared to his account. (And satellite will be elsewhere too). (Please correct if something is wrong). But apparently he gives visual 'path' of satellite, which he says is to the West of their at any time, so this may not make much difference to the conclusion. Does he really know the 'path' (and right satellite?) -not clear. He really need to give full details how he got to his conclusion, to discuss it further. Resurs is on the so-called -'solar stationary' orbit; that means, re-appearing at about the same local time, but also, eastward precession of the orbit at 1 degree per day , due o non-spherical earth effects and to compensate for yearly cycle. Also it can maneuver to perform photo tasks, presumably. So, he ought to give full details how 'path' in his graphics was determined, and send full details to Russian MOD for comment. This is a commercial satellite, presumably there are military ones not widely known, he watches over them all or what? With all their precessions and maneuvers, -and unpublished orbits to begin with? -RS. Resurs P1 tracking is here. Period is 94 minutes, appearing further West on each loop due to Earth rotation. On the next day, will not appear in the same place, as 94 does not divide number of minutes in a day; likely will repeat eventually, or else wander around. 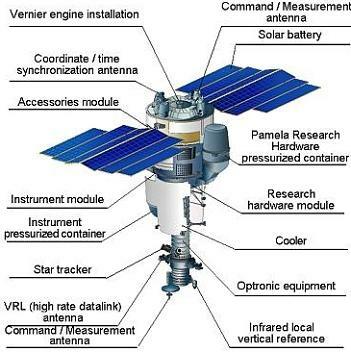 Resurs P1 has engine (integrated engine installation/vernier engine installation), so it can adjust the orbit, in addition to predictable changes due to Earth rotation. Persona is a reconnaissance sattelite derived from Resurs family. Cosmos 2486 apparently is one of them, and is on a close orbit with about a half-period delay. Similarly to Resurs has engine and can adjust orbit (without notifying Sattrackcam about that). Sattrackcam testified in a hearing of the committee for Foreign Affairs of Dutch Parliament in the Hague, as external expert on satellite tracking. This is a bit strange thing to do (if some weight is attached to the testimony further down the road), as there are huge number of satellites and accurately tracking them on a given day is a onerous, especially for an amateur observation enterprise. In the end of the day, they probably do some observations and than let software do the rest (without software, very likely a confusion, what is where and how it is called). But if something changes (maneuvers, accumulated precession, etc), their software is not going to tell them about it. So they may be believing in some spotting prediction, but it does not mean the prediction is true. (FWIW). Shows that positions appeared on google maps around 16 July, 2014 (not checked); some video footage shown of the positions and Ukrainian insignia; clips with a man (Andrey Kostin) telling us where Ukrainian positions were, he claims that a missile flew from there in the direction of, roughly Grabovo; another man filmed in summer time in a field tells that access to the area was blocked, claims that he saw a radar. Seen earlier material in the rest of the video. Only compares images from Donetsk AA base. Does not address Zaroshchenskoye at all. This page was last edited on 31 March 2019, at 01:43.